South Ayrshire Provost Helen Moonie has awarded a rare Provost’s Medal to Wallace Galbraith MBE, founder of the acclaimed Ayrshire Fiddle Orchestra (AFO). The surprise award took place towards the end of a Christmas concert the AFO were giving at Ayr Town Hall tonight, Saturday 22 December 2012, which also marked their 30th anniversary, having been formed in 1982, two years after Wallace had formed the Scottish Fiddle Orchestra with the late John Mason. With three numbers left to play on the programme, Provost Moonie took to the stage and delighted the audience by calling Wallace to the front. She said: “Wallace is a fantastic man and loves nothing better than getting folks up on stage, in front of an audience to play their hearts and souls out – and he does it very well. To warm applause, Provost Moonie continued: “The Provost’s Medal is awarded on very rare occasions to mark an exceptional individual in local life, who has made a truly outstanding to their local community. 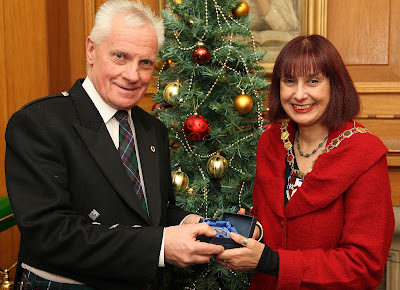 “This is the first time I’ve had the honour to award a Provost’s Medal and Wallace has been unstinting in his contribution to music, arts and culture in South Ayrshire. “At this festive time of year, when giving is better than receiving, Wallace embodies those qualities and values better than anyone I know – whether it’s his time, a helping hand, a friendly ear or a word of well timed advice. Provost Moonie then presented the Medal to Wallace, who received a rapturous ovation from the Orchestra and audience alike. Wallace Galbraith began his career as a baker with the family firm WC Galbraith & Sons, but the lure of music took him into teaching the violin in South Ayrshire Schools. In 1980, the late John Mason invited him to become a founder member of the Scottish Fiddle Orchestra and Ayrshire Junior Fiddle Orchestra was born, performing its first concert in August 1982. Success followed and, in addition to a huge local following, the AFO enjoyed international success with trips to France, Canada, Australia, America, China, Denmark, Germany, Norway, Italy, Switzerland and Spain. Wallace was awarded the MBE for services to music through the Fiddle Orchestra in 2000 and retired from teaching in 2004. Since then, he has devoted his time to the development and growth of the AFO.